When a purchase is successfully processed, PayPal sends a message back to your account and puts the purchase in a log file. You can search this log and download to Excel. What does "family not found" mean? Date: enter the from and to date - the initial view looks back 90 days. Reconciled: this feature allows you to keep track of items that you've either delivered or have reconciled with your PayPal account. The default is No. Type: general, family, parent or student membership or donation. Paypal TXN: enter the transaction ID from your paypal account. Tip: Click Clear to view all transactions, reconciled or not. 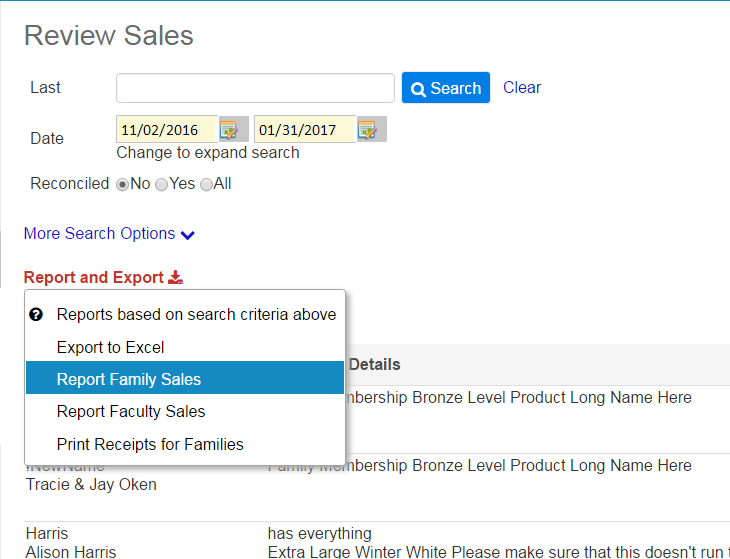 Once you've entered your search criteria, you can report by family, faculty, print receipts for each family and export, all based upon the search results. Report by family or faculty - create a report, grouped by each with subtotals by family and a total for the report. Receipts - creates a receipt, one page per family, for the all items found in your search. Super handy for delivering spiritwear! Export - export the raw data and slice and dice as you need. The system provide a checkbox to keep track of items that you've reconciled or reviewed. While not required, this is handy to keep track of items that you've delivered, such as spirit wear or yearbooks or if you need to deliver. 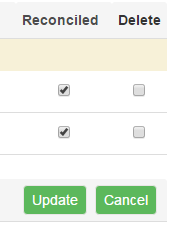 To reconcile, check the reconciled box next to the transaction and click update. To delete a transaction or group of transactions, check the delete box and click Update. This will permanently delete. What does it mean when I search and the family name is gray? When a family is deleted from your system, either by the graduation process or by you as the administrator, we remove all records associated with the family with the exception of the payment transaction log. This is to ensure that you can always reconcile with PayPal. If you search and see this message, it means that the family record associated with this transaction is no longer in your account.